CHALMETTE, Louisiana, September 7, 2010 (ENS) – After a 2 am power outage on Labor Day, ExxonMobil’s Chalmette Refining released at least one ton of catalyst that coated houses, streets and cars with a powdery dust. The catalyst covered St. Bernard Parish and fell as far away as New Orleans’ Lower Ninth Ward. “Fortunately there were no injuries, and we’re operating right now and meeting our customer needs,” said Chalmette Refining public affairs manager Will Hinson. But Hinson could not precisely identify the components of the catalyst that was released from the refinery on Monday. Catalysts remove sulfur, nitrogen and other contaminants from crude oil feedstock as it goes through the refining process. During processing catalysts become contaminated with impurities in the crude oil feed. Spent catalysts can contain coke, sulfur, vanadium and nickel and they may pose environmental problems, as landfill disposal is no longer accepted as best practice. Since 1998, the U.S. EPA has listed most types of spent catalyst from petroleum refining facilities as hazardous waste. This incident, occurring just as people were planning to barbecue and play outside for the three-day weekend, is one incident in an ongoing pattern for the refinery, residents say. The Material Safety Data Sheet Chalmette Refining submitted to the state after the incident says catalyst can be an irritant to the eyes and skin. It can be an irritant if inhaled or ingested. Clothes and shoes that touch catalyst should be decontaminated or thrown away, according to the Material Safety Data Sheet. Workers are instructed to wear gloves while handling catalyst. “It’s everywhere. As the cars were going down the street, it looked like they were on a dirt road with the dust clouds going behind them. I went and shook the tree branch and it was just like a dust cloud came off of it,” said St. Bernard Fire Chief Thomas Stone. Residents spent Monday trying to get the powder off backyard play equipment, cars and out of air conditioning units. 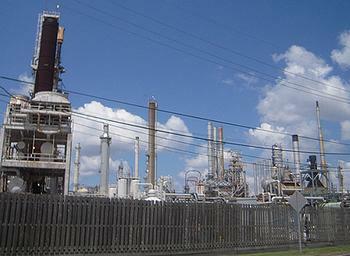 Today, Chalmette Refinery says it has hired a company to come clean people’s property. For more information, call the toll-free number 1-877-657-2833.